“Thornbury has lost one of its oldest and best-known residents by the death of Mr Edmund Cullimore, of Shen, Thornbury, in his 91st year. During the course of his long and tremendously active life Mr Cullimore not only founded the Thornbury Saw Mills and Brick Yards, but he pioneered the introduction of electricity to the town, maintained the Gas Company at a critical period, and for many years took a prominent part in the public life of the community. Mr Cullimore was a member of Thornbury Parish Council from its inception in 1894 until ill-health caused his retirement about four years ago. He had also been a member of the Town Trust, and had represented Thornbury on the Gloucestershire County Council and on the Thornbury District Council and Board of Guardians for many years. He was appointed a magistrate some 20 years ago; he was a governor of Thornbury Grammar School and one of the earliest members of the Thornbury Permanent Benefit Society. He took an active part in politics, championing the Liberal cause. It was he, too, who had the Thornbury Picture House built just over 21 years ago. At Thornbury Police Court on Tuesday morning Captain R. A. Bennett, chairman of the Bench, referred to Mr Cullimore’s death, stating that for 10 years Mr Cullimore sat regularly on the Bench and took the greatest interest in all proceedings, but about 10 years ago, owing to increasing deafness he ceased to take any active participation in the Bench’s work at Petty Sessions, although he continued to remain a magistrate. Mr Cullimore also held many public appointments in the town and he was always most conscientious in his work in that connection. He asked Mr S. P. Taylor (Magistrates clerk) to write a letter to Mrs Cullimore expressing the Bench’s great sympathy with her at her bereavement. Associating himself with all the Chairman had said, Mr Taylor added that Mr Cullimore was a considerable figure in the life of the town and district of a large number of years until recently, and Thornbury would not be quite the same without him“. The 1851 census shows Ambrose Cullimore a farmer aged 37 farming 40 acres with Hannah his wife aged 38. Both were born in Thornbury. Their children are William aged 19 Drusilla aged 15 Jane 11 Clara A 8, Leonard 3 and Edmund aged 3 months. A letter from Edmund Cullimore was printed in the Gazette on 27th December 1924. In the letter he referred to his childhood. “My first recollection of Thornbury was about 1853 to visit Dr Long’s in Castle Street to be vaccinated. The doctor was very tall and with his head held on one side and jocularly told people he was born with two heads but one dropped off, hence the position of the one left. He was very affable and clever and fond of a jibe, also good horses and dogs and a keen politician on the Liberal side. He offered me two half pennies to keep quiet while he operated on my arm.” He went on to say the doctor was true to his word and gave him the promised money. Mr Cullimore also mentioned that although he never suffered from small pox in his life, he was unconvinced that this good fortune was caused by the vaccination. According to Edmund’s other documented reminiscences, after periods at a Dame School kept by Mrs. Hawker at Oldbury Naite and at Oldbury National School, he was sent at the age of eight years to a private school at St. John Street, Thornbury kept by Mr. Champion. The Master was noted for driving knowledge into boys by severity: the means used were a cane and his hat (a soft one). This was used instead of the cane if the offence was not serious. Lessons consisted of learning to spell twelve words correctly, a sum and writing. Next young Edmund Cullimore went to Thornbury National School where the master was Mr. Joseph Lugg. The fee was 2d per week paid in advance. At this time the school was located next to the St Mary’s Churchyard outside the walls of the Castle. Mr. Lugg taught reading, writing, arithmetic, grammar, geography, history, poetry and gave lectures in anatomy. He took a great interest in the scholars’ games, taught cricket, football and hockey in proper season, also marbles and buttons. In the 1861 census the Cullimores were living at Oldbury Lane and Ambrose and Hannah have an additional son, George aged 5. There is also a 14 year old farm servant called Thomas Nash. Clara is the oldest child living with the family. We are grateful to a contact, Jane Bryn, for pointing out to us that Edmund, here described as Edward Cullimore was working as a farm bailiff for his half sister the widowed Drusilla Ann in Olveston by the time of the 1871 Census. Edmund married Sarah Adams in the Bristol area in September quarter 1876. Sarah was baptised at Rockhampton on 14th November 1850. She was the daughter of Ambrose Adams, a yeoman and his wife, Ruth. The 1871 census shows Ambrose had died and Ruth was now a farmer of 24 acres and a beerhouse keeper. Their home was called the Yew Tree Inn in Newton. Sarah was also living there with her mother and she was described as a governess. We think the photo on the left shows Edmund with Sarah. We know by 1879 Edmund had become a timber merchant living in Rockhampton as he is described in that way when he acted as trustee of William Weekes, the late father of Edmund’s half sister, Drusilla. The 1881 census shows Edmund was a timber merchant living in Yew Tree Farm, Newton just outside Thornbury. He was employing 9 men and two boys. His mother in law, Ruth Adams was also living in the house and she was described as a publican. They have an 18 year old servant called George Bennett and a lodger called Joel Bendall. Edmund and Sarah had a daughter, Helen Garfield Cullimore who was born in December quarter 1881. We don’t know where the middle name of Garfield comes from. In 1886 Edmund acquired about 6 acres of land in Thornbury from the trustees of John Wetmore Grove who had died in December 1885. In his will John had directed that his daughter, Anna Maria Bevan (the wife of James Bevan) be given the first opportunity to buy the property. When she declined the offer, Edmund bought it, paying £1040 for the property, of which £450 was paid to John King of Rockhampton who had provided John Wetmore Grove with a mortgage. The property was described as: all that close of pasture land formerly three closes called the Home Closes then planted to an orchard and having a frontage to New Gloucester Road in the occupation of Mr John Williams as tenant thereof and bounded by lands of Edward Stafford Howard Esq M. P., the governors of Thornbury Grammar School, Mr J. Williams and Mr G. Hodges and where the said close of land is number 307 on the Tithe Commutation Award for the said parish of Thornbury. This was copyhold land bought in customary fee simple under the will of the Lord of the Manor and subject to rents payable to the Manor. In June 1886, the trustees for the will of Henry Howard deceased who was the former Lord of the Manor agreed to sell the property to Edmund in fee simple for £78 16s 0d, thus removing the need to customary rent to the Manor. On 5th July 1888 Edmund sold part of this orchard land fronting Gloucester Road (containing 1 rood and 25 perches) to Walter William Pitcher for the erection of the house and outbuildings which later became known as 24 Gloucester Road. We have a copy of an abstract of title for the remainder of the property bought by Edmund in 1886. The abstract together with the attached plan (which can be seen by clicking on the thumbnail on the right) gives an indication of how the property was being used. It refers to an indenture dated 6th July 1888 showing that Edmund was using a small part of the property as a timber yard and saw mill and that he had already erected a carpenter’s shop, stables and other sheds on the land. This area was coloured pink on the plan. Edmund had fenced off an area of pasture and orchard land (containing about 4 acres) with a small frontage to the Gloucester Road and that was being used John Day, butcher. This area was coloured green on the plan. Another small piece of fenced off garden land (1 rood and 20 perches) adjoining that occupied by John Day was being used by Edmund and this is where Edmund was to build his future home which he was to call ‘Shen‘. This area is marked in blue on the plan. The area coloured yellow was another fenced off area on which he was to build a pair of semi-detached houses which became known as ‘West Shen‘ and ‘The Elms’. The 1890 rate book shows Edmund was occupying the house later known as 10 The Plain. In the census of 1891 Edmund and Sarah are lodging at 7 The Crescent, Christchurch near Bournemouth. Edmund is described as a timber merchant and their daughter Helen is with them aged 8. We assume that the family must have been away ‘on holiday’ at the time of the census. We know very little about Edmund’s religious beliefs except a reference to him being a lay preacher at some stage. In 1895 he was Treasurer of the Gospel Total Abstinence Society. It seem that no issue was too insignificant to escape Mr Cullimore’s attention. Edmund Cullimore was also reported on 21st January 1899 as trying to get the the Board School to be more cost conscious. He got rather worked up about the waste of pens in the school and said that pen wipers should be provided or brought in by the children to prolong the life of the pens. George Whitfield who was at the meeting said that the Board had to provide all the basic requirements and so would have to buy the pen wipers while pens were “exceedingly cheap.” The matter was dropped. We have heard it said that Edmund ‘built’ several houses in Thornbury. We have found no evidence that Edmund ran his own firm of builders and we believe that a more appropriate description of his activities in this respect would be a ‘property developer’. Certainly he was associated with the building of several splendid houses in the town – starting with ‘Shen’ his own home built in 1891 and then the two houses built alongside this which were built in 1895/6. Edmund’s name appears on an abstract of title of two villas in Gloucester Road which were known as ‘Cefyn House’ and ‘The Tarn’ and which were being used as security in 1896 for a mortgage. We can’t be sure without seeing the deeds for these houses but we suspect that they could be early names for the two houses which became known as ‘West Shen’ and ‘The Elms’. The 1901 census shows Edmund settled into ‘Shen’. He was described as a timber merchant and saw mill proprietor aged 50. He was living with Sarah aged 50, their daughter, Helen aged 19, Fanny Adams, presumably a relative of Sarah’s who was living on her own means aged 59 born in Wotton Under Edge and a servant, Eva Ball aged 20 from Cam. According to his grand-daughter, Sally Gordon, the name of Shen comes from a place in the Bible. The Internet provides the following description of the word: ‘Shen – a tooth, probably some conspicuous tooth-shaped rock or crag (1Sam. 7:12), a place between which and Mizpeh Samuel set up his “Ebenezer.” In the Hebrew the word has the article prefixed, “the Shen.” The site is unknown’. On 11th February 1906 Edmund’s wife, Sarah, died aged 57. She was buried in Thornbury Cemetery and Edmund added the words ‘Beautiful rose of love that bloomed for me by the wayside’ after her name on the gravestone. The second wedding was when Edmund re-married – this time his wife was Amy Elizabeth Alpass. We don’t why but the wedding took place in the area of Newport, Monmouthshire. Amy was born on 11th May 1858, the daughter of Thomas and Emma Alpass (nee Clark) who came from Berkeley. In 1861 and 1871 the Alpass family were living at Oldbury Naite. In 1881 they were in Shepperdine House Farm, although by this time Amy had left home. We have been unable to locate her in either the 1881 or 1891 census. In 1901 Amy was living with her widowed mother at 81 High Street, Thornbury. The photograph on the left is of Edmund and Amy Cullimore at Shen. Following their wedding, it appears that Amy’s mother moved in to live with them in Shen as that was Emma Alpass’s address when she died on 4th March 1907. In 1914, Edmund had two more houses built on the west side of Gloucester Road. These were built in a field known as ‘Ten Acre Field’ and the houses became known as ‘Stevelands’ and ‘Auklands’. It is interesting to note that the two houses were initially occupied by two of Amy’s cousins, Ella, (who married Charles Phelps in 1914), and Lilly (who married Frederick Bishop in 1914). We understand that Edmund also had built a similar house in Park Road called ‘Westover’. Edmund was particularly good at using his wealth and influence for the benefit of his family. In addition to providing houses for several of them to live in, he helped in other ways although Edmund also seemed to get some benefit from his schemes. He was quick to see the potential of electricity and made good use of his son-in-law’s knowledge and enthusiasm for electricity. We understand Francis Grace had trained as an electrical engineer at Bristol Technical College and had worked for R A Lister Company at Dursley. 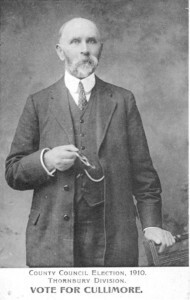 In spite of Francis being warned by his father not to get involved in the business of electricity, he is credited with the introduction of the new form of power to Thornbury in 1906. We suspect that Francis was encouraged and financially supported by Edmund. It was Edmund’s saw mill which was the initial source of electricity and its main customer. The earliest electricity in Thornbury was produced by burning the waste from the Saw Mill and this initially powered the saws directly. Later a bank of electrical accumulators had been installed nearby and a few houses in Thornbury received DC electricity. 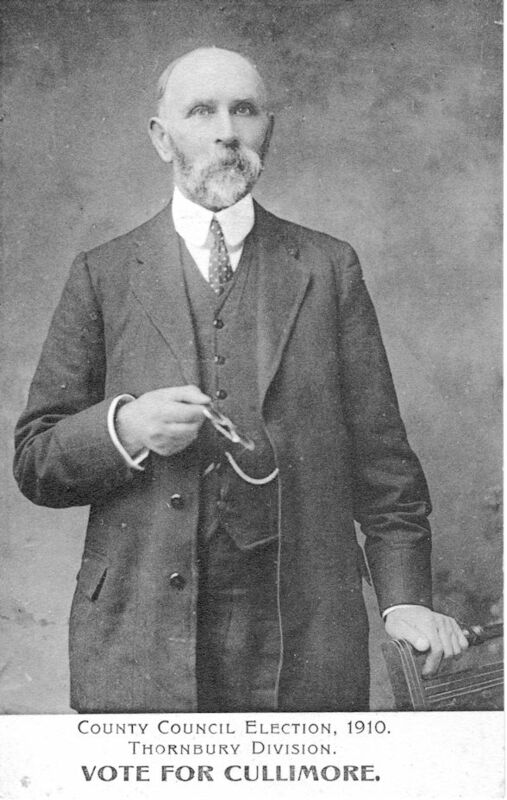 The situation was formalised on 9th June 1927 when Francis Henry Grace applied to the Electricity Supply Commissioners for authorisation “to supply and distribute electrical energy for all public and private purposes” within ” the circumference of a circle having a radius of one and one-third miles and having its centre at the Saw Mills Thornbury. During this period when there there was a danger of Francis and Helen moving to Canada, Edmund used his influence with the Thornbury Gas Company (in which he had acquired an interest) to ensure that Francis became Secretary for the Thornbury Gas Light and Coke Company. When the demand for gas expanded and a new showroom was required, Edmund provided a suitable site in St John’s Street and a new buildings with showroom was provided in 1932. Edmund and Amy were joined in Shen by their niece, Elizabeth and her husband, Dennis Haley and they continued living there after Edmund died and Amy moved away. Edmund and Amy continued living at Shen until he died on 6th September 1941 aged 90. He was buried in Thornbury Cemetery in the same grave as his first wife, Sarah. A quotation from Longfellow was inscribed after his name – ‘There’s a brave fellow. There’s a man of pluck. A man who is not afraid to say his say’. Amy died in the Central Spa Nursing Home in Cheltenham on 11th January 1943. She was aged 84. She was buried at Cheltenham Cemetery. She had been a staunch Methodist all her life and was a member of the Thornbury Methodist Church for over 50 years. She ‘made provision for the benefit of the Church in her will. In her earlier days she had been a Sunday School Teacher. We know from Edmund’s estate which put up for sale at auction on 5th November 1958 that Edmund had acquired a considerable amount of property in Rockhampton, Falfield, Oldbury, Thornbury and Wotton-Under-Edge. The notice of sale refers to ‘three freehold farms, a smallholding, accommodation land, woodland, cottages etc comprising 486 acres’. The farms included Pennywell Farm and Luce’s Farm, Rockhampton; Sunday’s Hill Farm, Falfield and the Old Holt Farm, Oldbury-on-Severn.